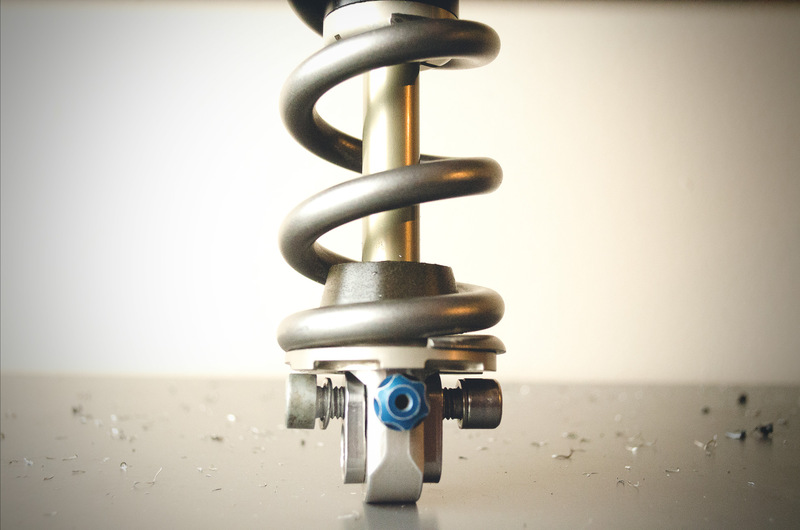 We’ve all seen offset shock bushes like the ones made by Burgtec, the folks at offsetbushings.com and that one Polish guy’s company called Proshox. 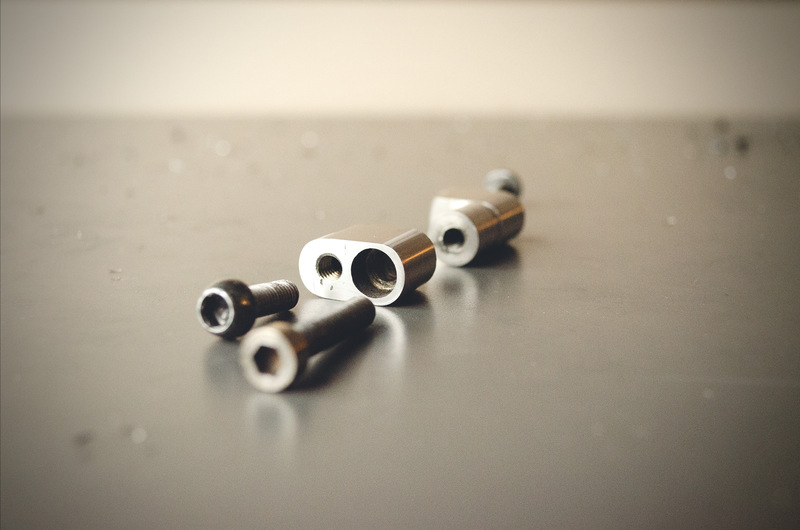 Those offset bushings work great if what you’re looking for is just a small geometry tweak in your frame. 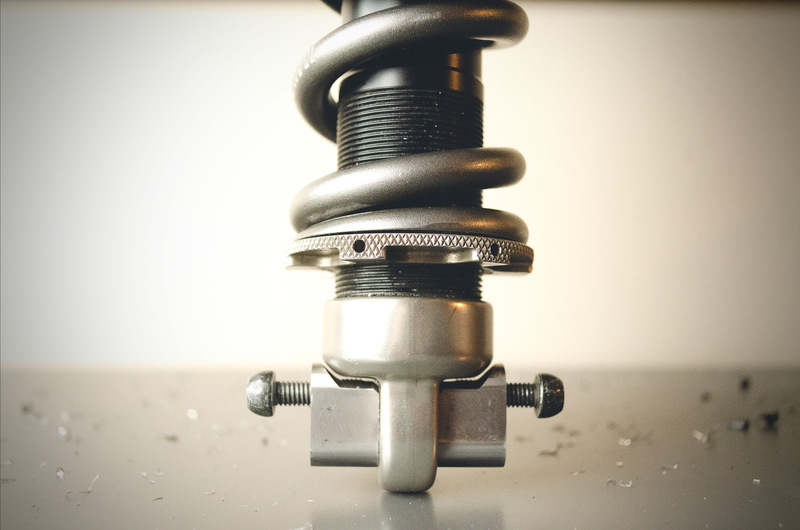 They’ll make your shock’s effective eye to eye length about 5mm shorter, which can slightly lower your bottom bracket and kick your head angle out a maximum of 1.5 degrees, but probably more like 1 degree for most setups. I’m going to walk you through a case study about a bike that had such a tall bottom bracket and such a steep headtube angle that it wasn’t even reasonable. 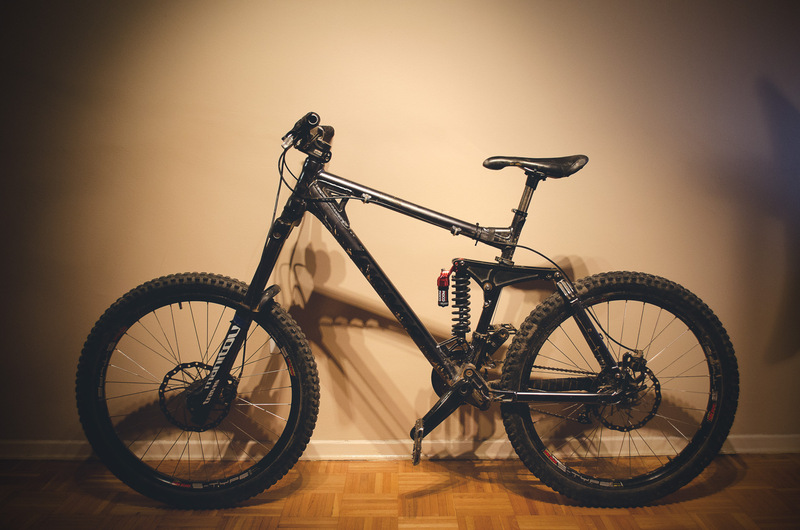 This bike desperately needed to be lowered and slacked out and not in a subtle way. To throw an even bigger monkey wrench into the situation, the customer wanted more travel out of his machine (stock was around 7 inches). Below is how it looked originally with a stock length 8.5 x 2.5 inch stroke shock. You can see what I mean. Super tall and super steep. To upgrade this setup, we went with a different shock that had a longer eye to eye measurement and a longer stroke. 8.75 x 2.75 was the best choice. 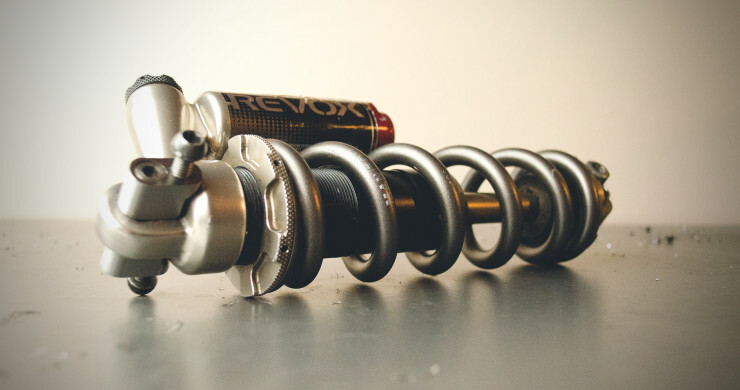 Of course putting in this longer shock would make the bike even taller and steeper, which is why I had to invent these. Above is the solution I created for the bottom eyelet. 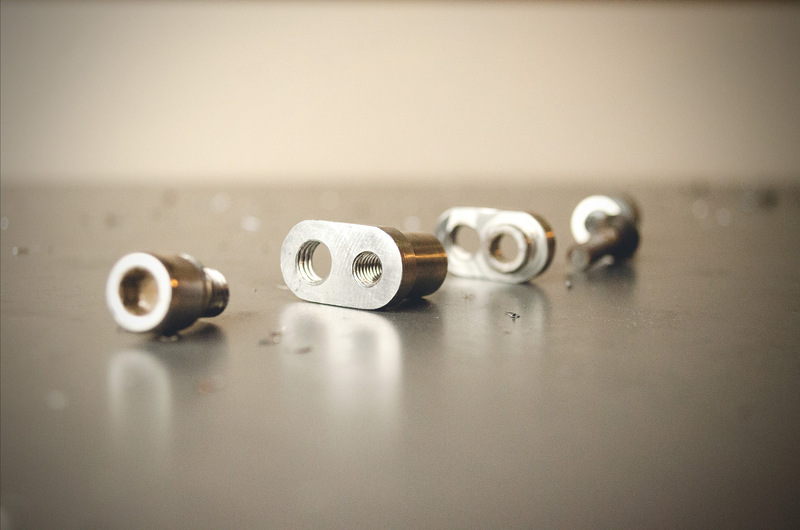 The width of this shock hardware needed to be 22mm, and the total offset for this eyelet was to be a whopping 12mm, previously unheard of in the shock offset world. You can clearly see the way the design works below. Since I didn’t want to modify the shock or do something stupid like drill into it, I had 2 bolts enter the sides of the shock hardware like you see in the picture above. That way I got the 12mm of offset at the bottom like I wanted. The top offset you can see below and its an even more interesting design but based off the same idea. Here it is mounted to the bike. 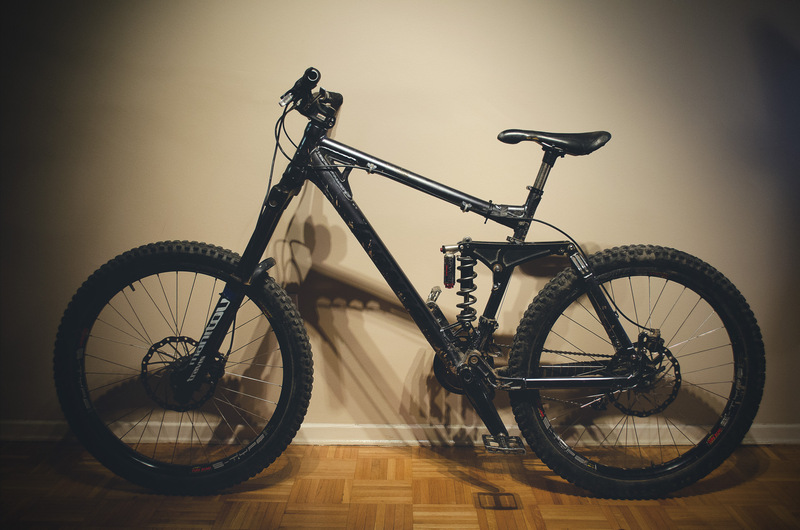 The bike has more travel now (about 7.7 inches) with the the longer 2.75 inch stroke shock and it sits visibly lower with the headtube angle visibly slacker. So what did the final measurements of the shock end up being? An amazing 8 inches eye to eye while retaining the full 2.75 inch stroke. 8 x 2.75, a first in the world. 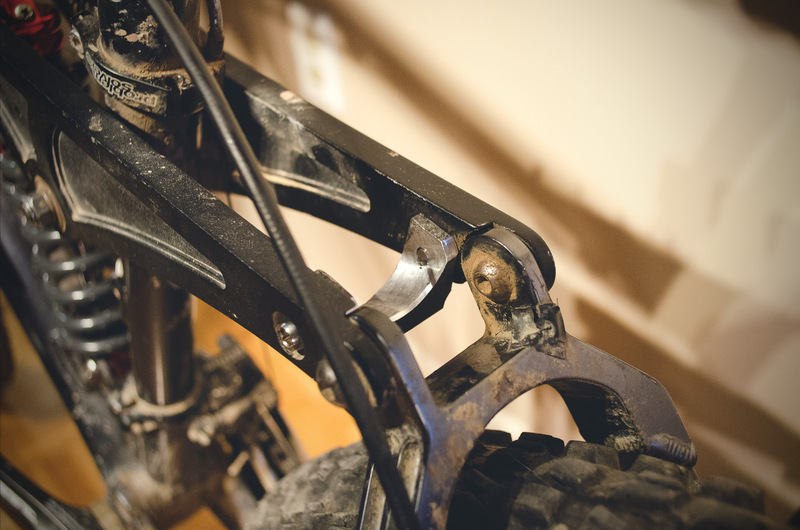 The one final mod that the frame needed to get more travel is this swingarm brace you’ll see below. It needed to be machined out to clear the seattube at full bottom out. I machined it out of a block of billet magnesium. It clears the seattube perfectly.